My favorite thing to do is to plan or host a birthday party, especially if it's my kids birthday party. Last week, my little girl turn 4 and the birthday celebrant have plan of her own, she want it at her grandma's house and she requested her favorite food Lumpia shanghai and Pancit- Bihon, meatballs, rice, cupcakes, balloons, goodie bag and of course the gift galore! 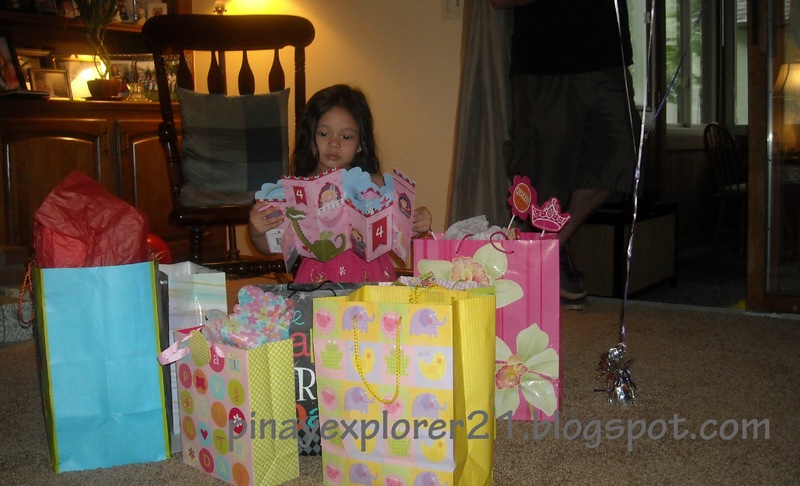 She was showered with lots of love and glorious gift from family and friends. 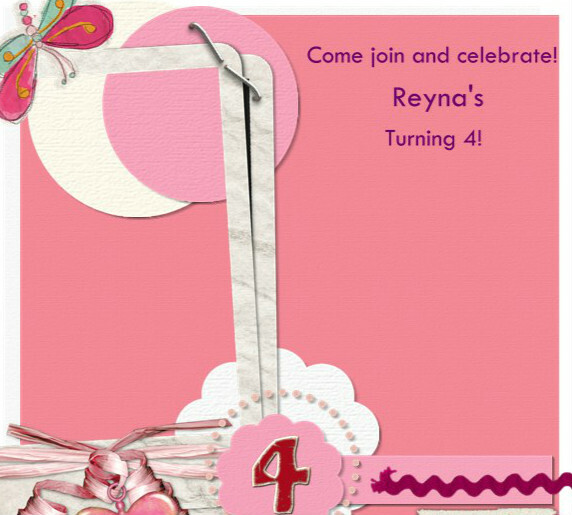 This is how we celebrate Reyna's 4th birthday, It just so simple yet so FUN! and some cute ideas for children birthday party that you can make at home. Bake cooled cupcake- I made mine out from the cake mix box. Put the chocolate chip on the middle to make look like a flower, slice cherries on the side and sprinkles. Put it on the refrigerator let it chill. - Goodie Bag for Everyone- I made a chocolate fudge butterfly brownies and chocolate chip cookies for goodie bags. I want not only the kids can enjoyed the goodie but also the adults. This is a very sweet gesture of saying " Thank You!" for coming and celebrating the party. -Using the butterfly cookie cutout, cut as many pieces as you want on the bake brownie, Put some pink icing on top of the brownie using your butter knife, Using the chocolate icing draw a thin butterfly line on the side to make it more like butterfly. 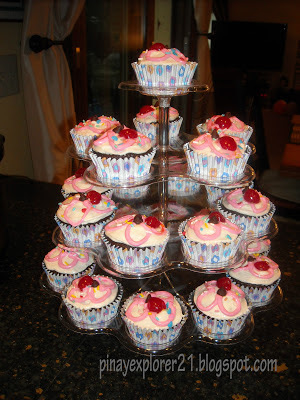 Let it cool and put it on the cupcake baking cups.. whola! ready to be taken anytime.! 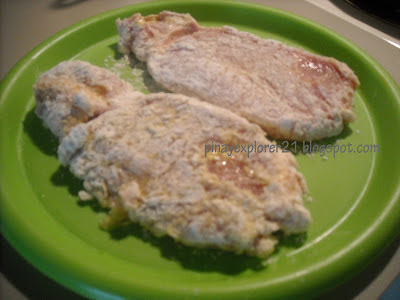 - I put the chocolate chip cookies on the pink cute little bags and tied with silver ribbons. - Birthday Food- I let my kids pick their own birthday food, and make it for them. This year, we had Lumpia, Pancit-Bihon, and grandma's meatball. - Birthday Gifts- She love opening present and I always make sure that I wrapped something for her, just cute simple things that little girls like. She got her ear-pierced which is so exciting for us. P.S.-I wanna extend my heart warming thank you to all,who greeted my baby bear on her birthday. To my beloved family here and back home and friends for being so generous and making her birthday extra special. "When I count of blessings, I count the time we spent together"
Last week, I celebrated my 5th wedding Anniversary. I was stoked how things turn out, It was simple yet so sweet. It's kinda strange feeling not hearing any whining or screaming in the house, but I'm so glad my mother in-law keep the kids overnight, so that we can go out and celebrate. Below is some ideas on how we celebrate our anniversary. 2.) Dinner at Outback Steakhouse- We had dinner at our favorite steakhouse, get some drinks and the food is just divine. 3.) Movie Night- After our dinner, we pick up some movie at the store. The perfect movie night just the two of us. 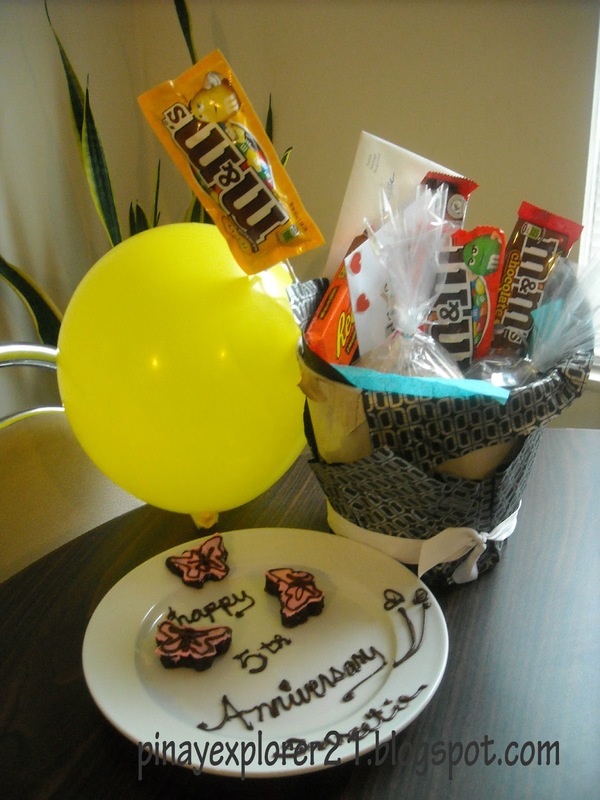 Making the perfect Anniversary Gift: What's Inside the Bucket Treats? example: Traditional Anniversary that represent "WOOD" something like that and much more. He asked me? How long it took you to find this card?! I just laughed.. 5 years? -That's how my anniversary celebration went, I hope you get some sweet ideas for your special someone.. and surprise them with this cute, simple gestures. I know they gonna love it! * Click the slideshow twice. 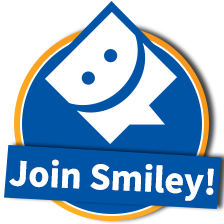 *click the YouTube video and slideshow at the same time. I love you! and Happy Anniversary to US.. and cheers for years to come. Bringing back those fun moments on our hot summer wedding, I made slideshow together with our wedding song, until now It makes me sooo KILIG! every time I hear it. Love much! Macaroni Salad is my ultimate summer favorite snack, for the reason that it just perfectly divine. I was totally in-love with this dish, believe it or not, I can eat the whole thing in like two days.. ooppps! that's like carbs overload, but I don't really care. 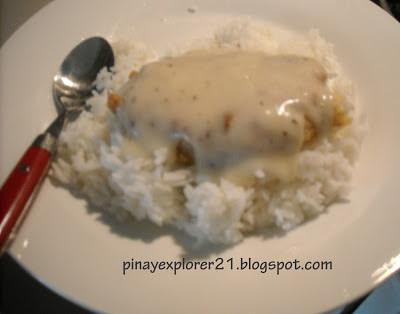 ( hahaha ) Honestly, I do share this delicious Filipino delicacy to my friends and family. This is very popular on Christmas and New Year in the Philippines and every time I missed it, I just make it right away.. Delish! 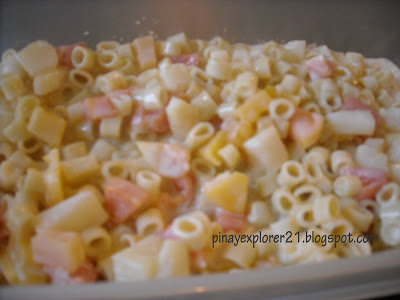 Aside from Mango Float and Shakoy, Macaroni Salad is also my kiddies most requested treat, they just simply loved it. So, this is just like my version of Macaroni Salad. This somewhat like freestyle version, whatever you have in hand used it. I'll keep mine simple and easy. It is also good to add your favorites like kaong, nata de coco, or macapuno string. 1.) Cook the pasta according to the package instructions. Drain and let it cool. 2.) Drain the tropical fruit, slice it into small pieces. 3.) 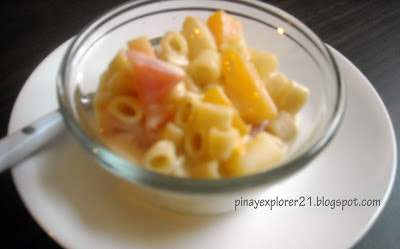 In large bowl put the macaroni/ditalini pasta, tropical fruit, mayonnaise, condensed milk and the nestle cream. Mix it well or until everything is combine. 4.) 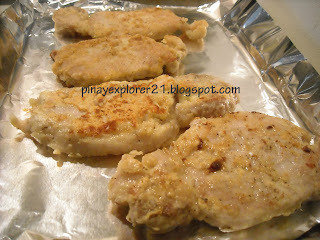 Chill it on the refrigerator for 2 hours before eating. Serve and Enjoy! You don't have to cut the tropical fruit. Refrigerate overnight for best result. My week was pretty busy lately, So, this semi-homemade pizza was become my inspiration. I never made homemade pizza before, when I saw this Betty Crocker Pizza mix at the store, I didn't have to think twice to give it a try. There's instruction on the back that makes me more excited than ever.. hahaha. How could you go wrong with this pizza mix, aside from easy instruction on the back of the package, the ingredients also is very simple and easy to find at the grocery store. This is like perfect meal for busy day. It turn out good and I loved it! you can change the pizza toppings whatever you like. 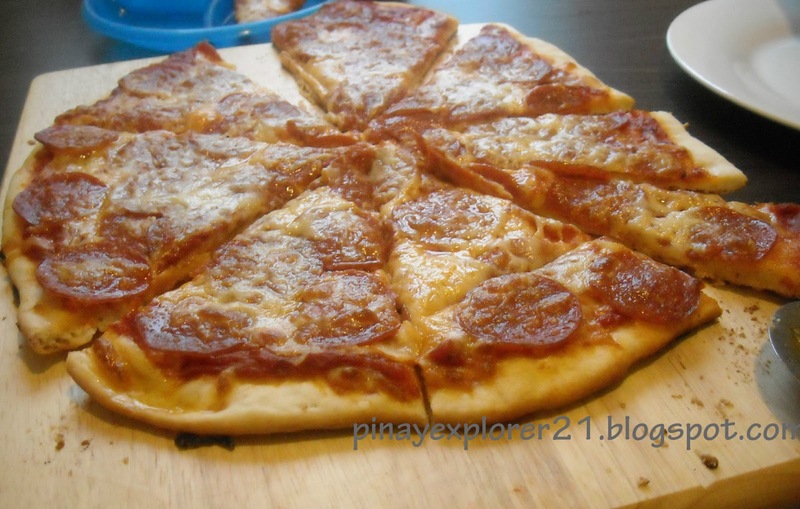 What's your favorite pizza toppings? Below is the ingredients of my version of semi-homemade pepperoni pizza. 2.) Form the pizza dough according to the size you want, I did somewhat like oblong/ square. Rub little olive oil on the top. Poke the dough using fork. 3.) 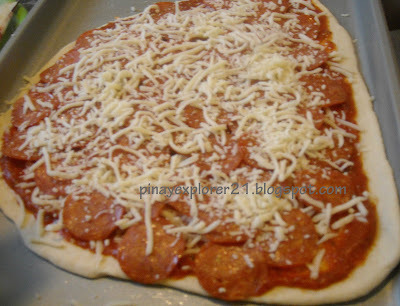 Put the pizza sauce first, followed by the cheese, and then scatter the pepperoni and then more cheese on top. 4.) Bake at 350 degrees for 15-20 minutes. Slice and Served!